The next part of the doc talks about creating a service principal. This has to be done by an Azure Stack Operator. Currently, the Kubernetes template only supports service principals with certificates for ADFS systems, despite the fact that client secrets was introduced in 1811. Hopefully this will be addressed and supported in a future version, as it will remove the requirement for the certificate and KeyVault. Once you’ve got the certificate, it needs to be uploaded to a KeyVault within your tenant subscription. The script provided in the doc does this for you, but you need to plug in quite a bit of information and there is the prospect of getting it wrong. I’ve simplified the process of creating the cert, service principal, creating a key vault and uploading the cert as a secret by producing a script to do the hard work for you. To run it, you need to be an Azure Stack Operator (ability to connect to the ERCS) as well as having access to tenant subscription on the stamp of which you are a contributor. # For Azure Stack development kit, this value is set to https://management.local.azurestack.external. We will read this from the AzureStackStampInformation output of the ERCS VM. # For Azure Stack development kit, this value is set to https://graph.local.azurestack.external/. We will read this from the AzureStackStampInformation output of the ERCS VM. $GraphAudience = "https://graph." + $AzureStackInfo.ExternalDomainFQDN + "/"
# TenantID for the stamp. We will read this from the AzureStackStampInformation output of the ERCS VM. $stat = "does not exist"
Write-Debug "Creating Self-signed cert and new Graph APplication..."
# This produces a self signed cert for testing purposes. It is preferred to use a managed certificate for this. write-Log "Client Id          : $($ServicePrincipal.ClientId)"
write-Log "Application Name  : $($ServicePrincipal.ApplicationName)"
write-Log "ARM EndPoint      : $ArmEndpoint"
write-Log "Admin Endpoint    : $AdminEndpoint"
write-Log "Graph Audience    : $GraphAudience"
write-Log "PFX Certificate   : $PFXFile"
$Filter = "name = '" + $env:USERNAME + "' AND domain = '" + $env:USERDOMAIN + "'"
New-AzureRmRoleAssignment -ApplicationID ($ServicePrincipal.ClientId) -RoleDefinitionName "Contributor" -Scope "/subscriptions/$($context.Id)"
Write-Log "Service principal clientId     : $($ServicePrincipal.ClientId)"
Write-Log "Key vault resource group       : $ResourceGroup "
Write-Log "Key vault name                 : $KeyvaultName"
Write-Log "Key vault secret               : $keyVaultSecretName"
write-Error "Certificate and Keyvault processing halted as KeyVault namespace already exists in this region. Please try another name"
I’ve formatted it so that you can copy paste it into the template. I could have created a parameter file, but for my purposes this was fine. 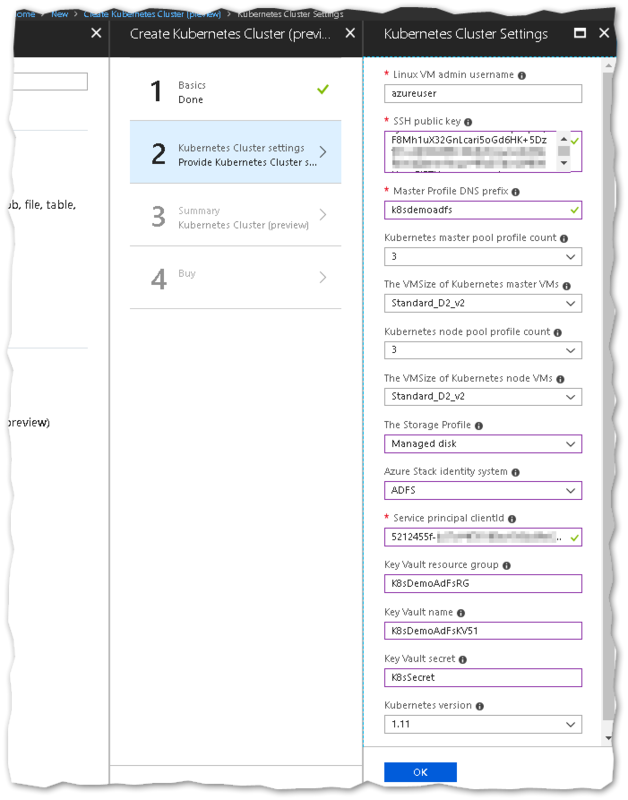 For a deeper understanding of whats happening when deploying the template, take a look at Ned Bellavance’s great post here: https://nedinthecloud.com/2019/02/19/azure-stack-kubernetes-cluster-is-not-aks/ .